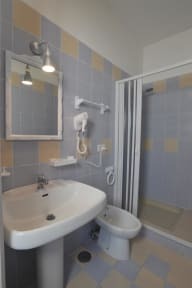 The Bed and Breakfast Sweet Home is the perfect solution for your holidays in Pompeii. 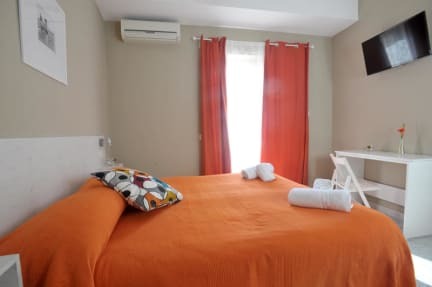 Right 400 meter from the main entrance of the Pompei Ruins Park, B&B Sweet Home has a superb position with an amazing view on the famous Vulcano Vesuvius .Pompei is 30 minutes from Napoli Piazza Garibaldi or Central Station. You can take the local train(Circumvesuviana) that leaves from the lower floor of the station. Take the Napoli-Sorrento line (direction Sorrento). Pompei Villa Dei Misteri is the nearest stop from our B&B. visiting the ruins of Pompeii or the surrounding areas like Naples or Sorrento.The train station Pompei Scavi (Which is also next to one of the entrances to Pompeii) is about 10 minuets away and the other train station in Pompei is about 20 minuets away.The hostel is clean, tidy and comfortable and the owners are all very helpful. For two of us to stay here was the same price as a cheap hostel, but we got a private room, private toilet/bathroom, and room cleaning. We got in on a FlixBus and someone came and got us. It’s at a great location, a short walk to the ruins, where there is also a train station and a bus going to Vesuvius. Easy day trips to Naples, and more if you’re inclined to explore. Only downside is there’s no way to cook for yourself, though there is a kettle. Good wifi, and staff are accommodating. Perfect location to visit the ruins! Balcony, air con and super comfy bed. Definitely recommended! The breakfast is amazing. Really short walk to the ruins. Nice place. Overall, a very good choice in Pompeii. The rooms are very nice and the B&B is very close to the main entrance of the ruins. The staff was also nice and well-informed. The owner recommended a restaurant within walking distance that was very good and there are several bars and restaurants close by. The only downside was the breakfast, which I don’t think was really worth bothering with. Loved the decor in the hotel and rooms, the staff where very pleasant and helpful. Location is 5 minutes from the rain station and main gates into the ruins. There is a large roof top veranda where you can sit and enjoy the sun. The town centre is a good 25 minute walk away, there you will find a very nice Piazza, bars and restaurants. Super close to the Pompei site and train station. Very clean and modern. Only thing is don’t bother with the 15 euro dinner. We got some deli meats and cheese and semi cold piece of heated lasagne. What a lovely little b&b to visit the pompei ruins! About a 10 minute walk away from Pompei Scavi and The Ruins! The only downfall if is if you have to pay for breakfast thats not a b&b. Also didn’t know I had to Pay in cash and so I had ti get cash out to pay when checking out which was fine until I handed her the money and she was asking for extras to make the change up... But she was quite rude in that sense. I booked a private room with a double bed. When my boyfriend and I arrived to check in, I was told that what I had booked was for only one person, and for a second person the price for the room was 50 euros, not 30. For the same room. I know that city tax is charged per person, of course, but this wasn't that. They just charge per person for privates. I may have missed it, but I don't remember seeing anything to that effect while booking. Other than that, the stay was nice.